Free B5 Serum Offer - Carol Thompson Images, Inc. Receive a B5 Serum ($69 value) Free with the purchase of the Ferulic Serum. 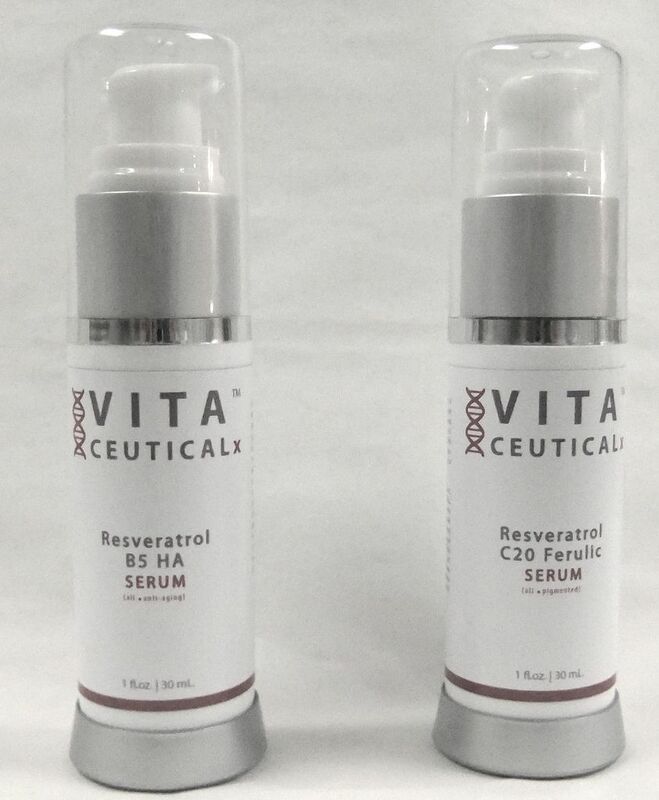 VITA CEUTICALX RESVERATROL FERULIC SERUM - All Skin Types Experience the amazing revitalizing benefits of this unique antioxidant cocktail infused with 20% vitamin C and ferulic acid. Naturally derived Asafetida and Sugar Apple Extracts aid in cellular interaction and encourage collagen synthesis. Gently exfoliating malic acid offers a greater penetration of vitamin C and active botanicals, enhancing the benefits of this age reversing serum. Ideally suited to those who experience premature aging or environmental oxidation. An excellent serum for preventing the visible consequences of cumulative sun exposure. How to use: Apply a thin layer of antioxidant of serum to the entire face and neck avoiding eye area. Allow 3-5 minutes for absorption - follow with moisturizer suitable for skin type. Apply twice a day for maximum benefits. Ingredients: Purified Water (aqua), L-ascorbic Acid, Xanthan Gum, Silica, Cellulose Gum, Vegetable Glycerine, Sodium Ascorbyl Phosphate, Ferulic Acid, Resveratrol, Hydroxymethyl Glycinate, Annosa Squamosa (Sugar Apple Tree) Seed Extract, Asafetida Extract, Malic Acid, Gluconolactone, Daucus Carota Sativa (carrot) Root Extract, V itis Vinifera (grape skin) Extract, Chlorophyll. 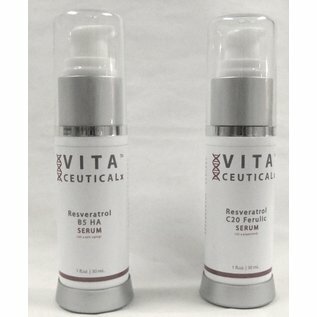 VITA CEUTICALX RESVERATROL B5 SERUM - All Skin Types Soothe dryness instantly with this gel-serum boosted with multiple sources of Viramin B. Non-greasy, this antioxidant serum maximizes the benefits of a daily moisturizer and is suitable for all skin types who desire a velvety smooth texture and youthful appearance. Vital nutrients literally drench skin in humectants, smoothing dryness upon contact. Phyto hyaluronate and Resveratrol make this elixir impossible to resist. B5 Serum soothes, moisturizes and balances devitalized skin. This superior hydrating Serum helps fortify the intercellular matrix creating an environment that offers healthier cell groth, development and repair. Resveratrol a natural compound found in grapes, increases the lifespan of skin cells and is a powerful activator of cellular renewal. The dermis is strengthened and skin is left firmer and denser. Wrinkles are smoothed from the inside and facial contours are redefined. How to use: After cleansing and toning, apply a drop of serum to forehead, chin and cheeks and massage in gently. Follow with Ferulic Serum then moisturizer. Ingredients: Aqua (purified water), panthenol, propylene glycol/faex, vegetable glycerine, vitis vinifera skin extract, vitis vinifera (grape) seed oil, hydroxyethylcellulose, hydoxymethylglycinate, niacin, citrus grandis (grapefruit) peel oil, citrus nobilis (mandarin orange) peel oil, citrus aurantium dulcis (orange) peel oil, cymbopogon schoenanthus (lemongrass) oil, rosmarinus officinalis (rosemary) oil, riboflavin, phyto hyaluronate, sorbic acid.